Which one of these is not a web browser? Getting people to understand what we webdevelopers do can be hard. Just look at the infamous Google video asking people what a web browser is, with no one having a clue. OMG!Ubuntu! 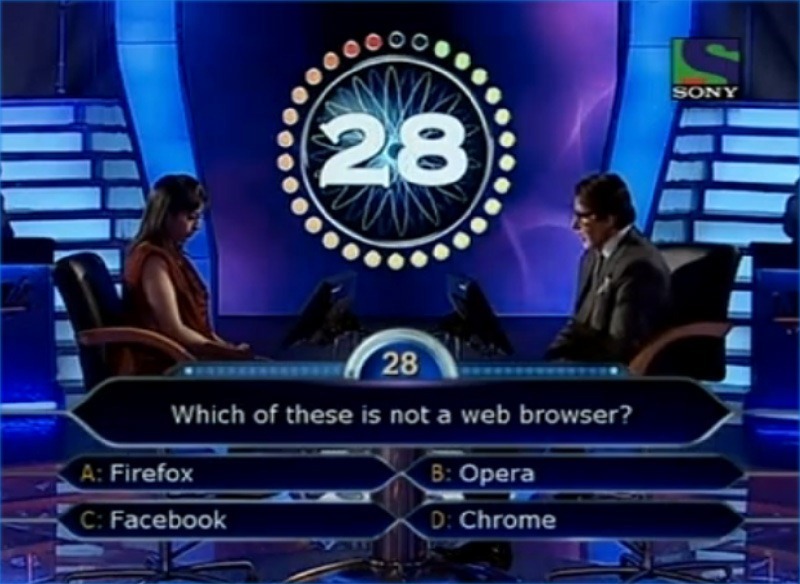 recently posted about something similar, where a question on the Indian “Who wants to be a millionaire” was “Which one of these is not a web browser?”. The choice was between Firefox, Opera, Facebook and Chrome. Did the contestant pick correctly? …But it took the entire audience. But dig a little deeper and people are actually a lot smarter than given credit for. Had those people […] been given a laptop and asked to log in to Facebook the majority would’ve managed it fine. And that’s just it. Who cares if people don’t know the difference between a browser and a search engine. They can use their computers to visit your website, that’s awesome. Knowing what a browser is isn’t important, it’s knowing how to use one that is. I don’t think this is about the general public being stupid…I personally think it has more to do with tech people never properly explaining the big picture of what different applications/programs are and what exactly you do on a computer. I think plenty of people would be able to come up with “it’s what you use to view web pages”, but they wouldn’t know what NOUN to use for it. They’ve never had to conceptualize the big picture because all they see at any given moment is a GUI, prompting them to click or type to get what they want. Cufón vs. Typeface.js, which one is better? Laserey.es: Draw lasers from your eyes.